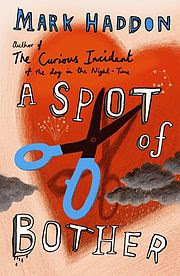 I am sure those who have read 'The Curious Case of the dog at the night time' by Mark Haddon must have added 'A Spot of Bother' by the author in their TBR list. I too had and that's why I picked it up from the library as soon as I spotted it. The story starts with George Hall, a rather quiet man who has retired from his work and is looking forward to a comfortable, quiet life. But, things does not go as per his wishes and expectations. George is hypochondriac and hence when he notices a leison on his hip while trying out a suit in a shop, he is certain that it is a symptom of the onset of cancer. He ignores the doctor's diagnosis of eczema and get sets to put things right himself by doing a self surgery, by cutting the flesh with a pair of scissors! Well, things are bound not to go his way and he nearly acts like a mad man. But, that is not the only thing going wrong in George's life. His wife, Jean is courting his ex- colleague and is contemplating on leaving George. Also, his divorced daughter is going to tie the knot with his boy friend, Ray, who is not very much liked by her family. On top of all this, his son Jamie who is a gay is deciding on going public about his sexual orientation, much to the embarrassment of the the family. All this adds to the trauma of the old man and he has panic attacks every now and then. After having enjoyed Haddon's The Curious Case of the dog at the Night Time', I was looking forward to a similar experience in 'A Spot of Bother'. But it turned out to be a big let down for me. This book lies in my book shelf! Had picked it almost 2 years back. Dunno why!! As this title is sitting on my TBR shelf and like you I enjoyed The Curious Incident of the Dog in the Nighttime, I found this review informative. I do not think I will be reading it any time soon.